Pride by any other name would smell as wretched. Often we dress up pride. We give it acceptable names, fancy names even; hard-headed, stubborn, strong-willed. We parade our dressed-up pride down the red carpet, praising it for it's pretty clothes, seeing a virtue instead of a vice. Sometimes we dress down pride, giving it the humble clothing of a more vulnerable name, insecurity. We miss seeing pride as it slips by us in its understated quieter outfit. We adorn it as mask, a hoodie to hide our face, as we excuse the fatal mistake of seeking our value in other's opinions of us. 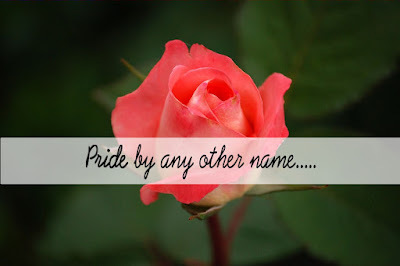 Pride by any other name would smell as wretched, be it strong-willed or insecure. It is the smell that robs your peace, distracts you from your mission in life. To everyone it smell the same, the smell of self-absorption.